So, just how effective is to soundproof a room by using egg cartons? Often when people are wondering about the cheapest way of soundproofing their walls, the first thought that comes into your mind is the use of egg cartons. But do these really work? People cite many reasons in the attempt of defending their belief and top in the list is that their round shape, very similar to what you see in recording studio, that on first sight lead many to think that these crates can actually absorb some noise since sound will not bounce back from the solid flat surface. However, it is high time that we unmask this myth since people are still testing and believing in it. Therefore, an attempt is made in this article to explain why putting egg boxes on your wall won’t soundproof your room. The vast majority are confusing this method with some other soundproofing methods, and although the use of egg cartons can be similar to soundproofing, it is not advisable to use egg crates for this purpose. Indeed, egg cartons can be used to reduce echo. But it is not necessary to put up egg cartons on the wall to reduce echo since your furniture is playing that role already. Egg cartons can only slightly reduce some noise that could be created inside the room, but they do not have the capacity to reduce outdoor noise. This method will only do a very little to reduce impact noise for it is a difficult task to reduce low-frequency noise even with the real soundproofing materials. Thus, egg cartons cannot do much against these frequencies and noise will definitely pass through the wall like any other day. If your purpose was only to reduce the echo, then I would not talk you out of using egg crates, although not many people would enjoy the look of it on their walls – and a much superior effect can be got with a product like acoustic panels. But if your aim is to protect yourself from noise pollution, then the installation of egg cartons on the walls would be an utter waste of time and energy. If sound insulation is what you need then put the egg boxes into the recycling bin, and think about other options which will keen the noise from outside away – there are some great acoustic wall solutions out there. So, before you get into the business of buying more eggs than you can eat just to make soundproofing material from the trays, be aware of how limited these are in what they can and cannot do. Soundproofing materials such as acoustic panels and foam are specially designed with numerous open cell air pockets inside them which absorb sound by moving when hit by a sound wave and in the process, the sound energy is transformed into kinetic energy and heat. As you study your egg carton, it will not take you a long time to realize that it lacks open cells and has no ability at all to move at any level upon being hit by a sound wave. 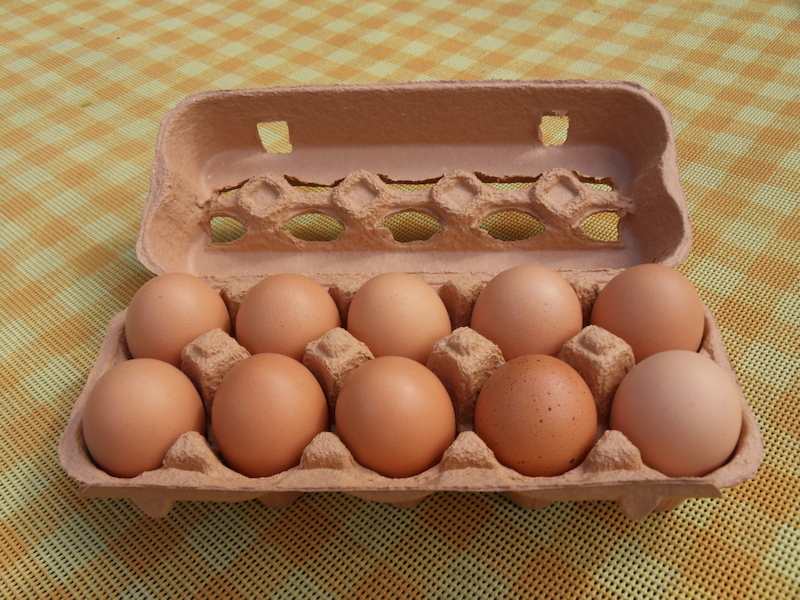 Moreover, egg cartons are thin and substandard soundproofing material. There are many cheap and affordable ways of soundproofing your house. If nothing else you can use soundproofing blankets, carpets or soundproofing curtains instead. It is the passion of most homeowners to take on soundproofing projects, and many will spend a lot of time, money and energy trying to soundproof their homes. In many instances, people who are keen on buying new homes prefer soundproof rooms since they could be allergic to noise. However, it is good to note that the most basic and important step towards soundproofing your home is soundproofing the door. The door is, of course, the biggest opening in most places that anyone would tend to soundproof and most people fail to realize that the doorway tends to be one of the most usual ways to let sound into the house. Instead of ignoring it, it would be advisable to prioritize the doorway whenever one is embarking on a soundproofing project. There are many ways of soundproofing the doorway, and the good news is that very few are expensive. For me, personally, the best way to soundproof a door in your home or office would be to install a solid core door instead of a hollow core door. Also attaching a rubber door sweep that is tight enough on the floor would seal the lower gap completely. There are many other ways of soundproofing the doorway since installing a solid core door can be expensive, especially for those working on a low budget. Gaps and cracks on the door are to be blamed for letting sound through the doorway. Most doors have cracks and gaps, and when you are looking to soundproof the door, you should try to seal them first. The challenge here would be to identify gaps and cracks especially when these are too tiny. I would, therefore, recommend that you ensure the room is dark and watch out for any light passing through the small cracks and gaps from outside. Sealing these cracks is easy since you can use the insulating sealant and in case the gaps are too small, you may go for the Red Devil Small Gap Foam. This tape is usually made from sound absorbing materials such as fiberglass. They are cheap and easy to install, for they come along with an adhesive that allows you to easily set it up. It would be good to ensure that you get enough compression while setting up the tape to make sure that an airtight seal is formed between the door and the tape since we give credit to this seal for keeping noise out. These blankets are also made from fiberglass. In fact, heavy soundproof blankets will absorb much of the sound. The blankets are easy to install since all you are required to do is to hang them onto the hooks at the back of your door. They are a good choice since it is possible to put them up and bring them down at will. Curtains make good sound absorbers since they are made of thick materials with the capability of dampening the impact of sound. When soundproofing your door, you may decide to use curtains that are specially designed to keep sound away and using them on the doorway will block out most of the unnecessary noise. I am certain that you will be amazed by the results upon taking a couple of these steps. Here at Soundstop.co.uk we have a collection of ready made solutions which will provide you with tried and tested solution to acoustic door insulation. Noise can indeed irritate your ears especially when your focus is set on other activities such as reading, meditating or even sleeping. In a family setting, noise often results from the activities of other family members, especially when they are washing clothes, and using kitchen appliances such as microwaves, washing machines, tumble dryers or refrigerators. It could be that the room adjacent to the kitchen is your bedroom and every time the microwave door is opened and closed, it sounds like the wall is being slammed with a brick and whenever the machine is working, you can hear it humming right through the wall. Well, all problems can be solved, and in this article, we outline some of the best solutions for the noise menace in your home. If the source of noise is a kitchen appliance such as a microwave, you can consider fixing a sound blocker membrane on the wall behind the microwave. The sound blocker membrane is an innovative material utilizing up to date technology, synthetic rubber and special heavy fillers. The membrane provides a minimum loss of room space for maximum noise reduction since it is thin. Not only is it versatile but it boasts a very high-performance noise reduction level – for example our TecSound range. Noise from washing machines and tumble driers can be a real nuisance. Essentially, several factors may be the cause of this. The washer could be old and ready for replacement, and even if it may not be too old, it may be in need of some repairs. The machines may be in direct contact with hard surfaces such as tile floors, walls or hardwood surfaces and the good news is that you can easily prevent your machine from vibrating against these surface when you implement some trusted soundproofing techniques. You can start any soundproofing job by assessing the possible sources of noise. The first step could be asking yourself questions such as; what kind of surfaces is it touching? it is old enough to be replaced? Since many machines have a tendency to skid along the floor, noise may be the result of their vibrations. To prevent this from happening, you may choose to have some kind of non-slip material under your machine. Therefore, it would be wise to purchase rubber anti-vibration pads and mats for the washing machines. In case you are not willing to spend money in your search of a solution, you may choose to fold up an old blanket and slide it under your machine. However, since that may not help the machine to remain steady, you might end up getting a rubber mat in the end. Additionally, covering your machine or tumble dryer with blankets is another good suggestion. You may choose to purchase soundproof blankets that are as wide as the washer and long enough to reach the floor. Unlike the washing machine, refrigerator noise is rarely loud enough to cause physical effects such as hearing loss. However, a noisy refrigerator can contribute to increased stress levels in a home. Noise occurring when the fan or ice maker turns on and off may startle the babies. Noises coming from the outside of the refrigerator may be due to the condenser fan or the compressor, and occasionally, noise can be the result of a loose door rattling. Therefore, you can solve the issue by examining your refrigerator to ensure that the doors are not loose, or fixing the motor properly. For a certainty you do not need to punish yourself with noise for solutions do exist. One of the things in life that no one can be free from are noises. Unless you live in a very remote part of the countryside inside a house with very thick walls, you’d have to deal with noise pollution every day. On the brighter side, you can at least get away with the noises at home by soundproofing it. Loud televisions, radios, noisy neighbours, vehicles passing by — these are just some of the noises that you would normally encounter. It can be frustrating when all you want to do is relax after a very tiring day. In general, people would want to soundproof their homes for two reasons. It can be because you want to keep or contain the sound within your home. An example of this is if you are a music enthusiast who uses instruments like drums or electric guitars. Naturally, you don’t want to bother your neighbours unless you want to be on their bad side. The other reason, which is very common, is when you want to keep the noise out. Noise pollution has been proven to affect one’s health negatively. In fact, a study about the noise produced around London’s Heathrow airport revealed an interesting and alarming finding. According to the study, high levels of aircraft noise was associated with increased risks of hospital admission and death by stroke, coronary heart disease, and cardiovascular disease in the nearby area. What you have to understand is that you don’t necessarily need to soundproof the whole house. In most cases, you’d want to do it only where it’s applicable. For instance, you may want to soundproof your study room so as not to disrupt your focus. If you also live in a flat and you have neighbours below, you may also want to consider just sound insulating the floor. There are only two ways that sound is generally treated— either absorb it or reduce it with heavy materials. By blocking the passage of sound waves intervening objects in the path of the sound, noise can be reduced. Though non-listed buildings come with their challenges when soundproofing needs to be done, it’s a lot easier to work with them compared to historic buildings. For starters, the work that needs to be done should not alter the character nor increase the risk of long-term deterioration of a historic building. This is one of the reasons why it’s critical to have a house survey conducted before renovating an old or listed building. Doing so will provide you with relevant sound insulation and technical information, as well as materials to be used for the work required. That said, it is an absolute must that you obtain a listed building consent before doing work on a historic building — that includes soundproofing. Not only that, but you also have to make sure that you adhere to the conditions on a listed building consent. It’s also worth noting that there are many design conditions and listed building constraints within this type of development. As such, it is highly recommended to get an architect involved during the design stage. The following can be done to soundproof any home, or a historic building for that matter. But before you begin with your soundproofing project, your first step is to find out if you need planning permission or not. You can do this by contacting your Local Planning Authority (LPA). Many have already used fake grass in their gardens as well as the other parts of their households. However, most people are not aware that artificial turf makes excellent sound insulators especially those that come with sound absorption panels on them. Installing fake grass on your walls will help soak up noise from traffic and passersby. Office lobbies, for instance, will benefit a lot from walls with fake grass. As a bonus, you will not only get the sound reduction benefits of synthetic turf, but you will also have a nice zen space as well. Upgrading your windows and doors will benefit the environment and your home. You see, doors and windows are two of the most likely culprits for heat loss and energy inefficiency. At the same time, these are also two areas that are often responsible for transferring noise to and from your home. And it only gets worse for historic buildings. Many historic buildings suffer a lot from unwanted noise because their windows are only single glazed. The good news is that double glazing can help reduce the noise level by up to 20%. Adding secondary glazing to a historic building will also not remove its original features. Then again, it’s always better to consult your local planning authority to be on the safe side. 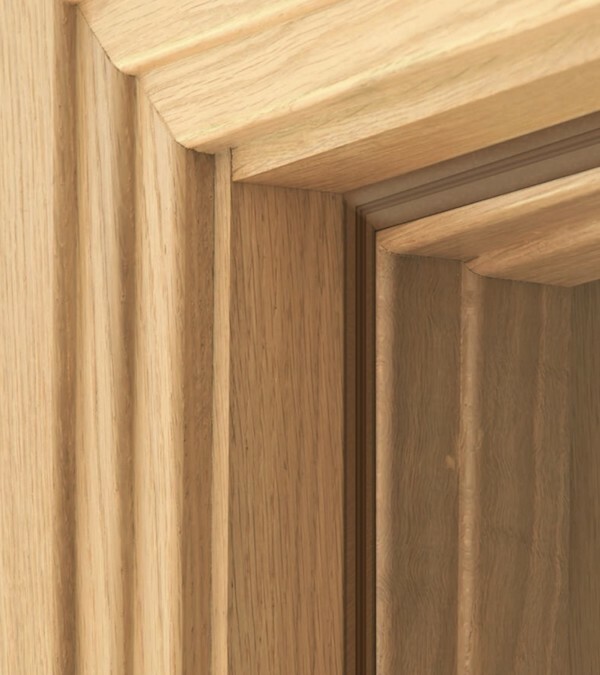 When it comes to doors, always remember that it’s not just about how thick they are. 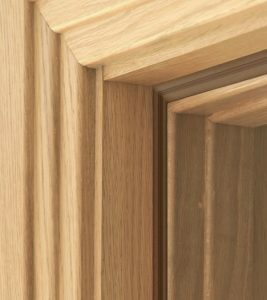 You also have to make sure that jambs, thresholds and door heads are also airtight. Putting special weather seals around the door frames can help dampen the noise. If you don’t want to go as far as upgrading your windows, you can deal with much of the outside noise by using acoustic curtains or blinds. It’s one of the simplest ways to soundproof a room. However, keep in mind that they don’t significantly reduce the decibel levels of sounds that enter but are effective in reducing echo in a room. Still, acoustic curtains are a good option if you don’t want to deal with planning permissions since they don’t require any invasive building work. The downside though is that you’d be forced to have your curtains or blinds permanently drawn so you can’t take advantage of natural light coming or even the view from the outside. Acoustic panelling is an excellent way to absorb any sound that can be bothersome to you. These panels are made of sound-absorbing materials like foam or mineral wool contained between decorative outer panels. On the other hand, the decorative outer panels can be made either of fabric, perforated metal, or other substances. Acoustic panels are incredibly effective, as well as being very practical. If you want to use this option of soundproofing, make sure you enlist the help of a professional. Be aware that you may also require written permission when adding panelling to a listed building, so seek advice first. Floors are often a bit to sound insulate than ceilings especially in listed properties. If you have neighbours below, there are two ways that you can soundproof your floor. The first method is by buying thicker and more sound-resistant carpets. The second is by having a specialised soundproof matting fitted. If you’re the one living under your neighbour, you’d naturally want to soundproof your ceiling. This will involve installing a false roof as well as inserting mineral wool insulation or soundproof tiling. Again, don’t forget to check with your local planning authority if this work requires permission. Aside from the obvious benefit of reducing if not eliminating noise, soundproofing your historic home has one other advantage. Many people who have done so noticed that significant decrease in their utility bills. One added benefit of insulating for sound is that you will also improve the thermal efficiency of a home as well. “Under the scheme, homes in the designated zone closest to the airport with higher levels of noise (the inner zone) would have the full costs of their noise insulation covered by the airport. Up to £3,000 in noise insulation would be offered to homes further away from the airport (the outer zone). We here at Soundstop, like so many others, believe that the scale of disruption and noise to residents who live around Heathrow, will be immense. More residents than ever before will suffer. While the design of aircraft over the last few years has made them around 50% quieter on departure, the frequency of flights is going to increase dramatically. According to a government analysis, when Heathrow builds the third runway, more than 2 million people will be exposed to additional aircraft noise. Major airports are, however, under a legal obligation to develop strategic noise maps and produce Noise Action Plans based on those maps. BAA has signed up to a scheme that offers free double glazing to mitigate noise. Hounslow council believes it is nowhere near enough – particularly for local schools who have already been deprived of vital renovations when Labour’s schoolbuilding programme was scrapped by Michael Gove. The cost of properly soundproofing children’s classrooms for the Borough’s 60 schools under the flight path is something Hounslow says it cannot, and should not have to, pay for. The bottom line is that unwanted aircraft noise will cause misery to many more people than ever before. Here at Soundstop we have experience in reducing the suffering and annoyance caused by unwanted noise. That’s our business, and we can help. First and foremost, you need to look at your windows. Realistically speaking these will be the major failing point for most people. It is important that you think about triple glazing, not just double glazing. But in reality, with the very heavy bass frequency sound that an aircraft produces, the better bet is to install a secondary glazing unit,ideally at least 10cm in front of the existing unit, which will cope far better with bass frequency. From a cost perspective, secondary glazing units run at around £500 per window. The drawback is that some of these secondary units mean that window opening is tricky so you will need to think about installing air-conditioning units. For residents much closer to the flight path they will also notice that sound will be coming through the upstairs bedroom ceilings. This is particularly the case where the ceiling leads onto a simple loft space that is not insulated and the only protection from the aircraft sound might just be be the tiles on the roof. In these cases, you will need to increase the mass of your ceiling. A simple project would be to add insulation ideally dense insulation in between the joists above. Here we recommend at a very minimum 45kg mineral wool slabs, but better still 60kg mineral wool slabs. This will help with thermal conductivity leaving your house warmer in the winter as well. The joists can then be overlaid with chipboard and ideally a layer of acoustic plasterboard over the top. Where this isn’t possible dues to access to the loft, you will need to think about soundproofing the ceilings. This isn’t as hard as one would imagine. 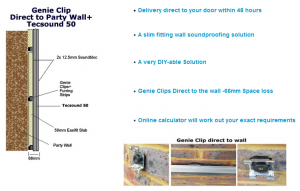 We have a number of possibilities but the most effective and mess free method is to use the genie clip system which is described on this page. Taking up minimal space it will make a very significant difference to the sound that will be coming though what is often a very thin ceiling. People also think that walls are an issue. In practice a well-built brick wall will offer reasonable noise protection. For this reason, we recommend the insulation of walls to be done only after addressing the windows and ceilings. Please let us know your thoughts and any suggestions on where affected residents might turn to seek relief from the anticipated noise of runway 3. We get asked a lot of questions at soundstop. And it has helped us create a tope five list of soundproofing myths that we wanted to share. 1) Egg boxes on the wall. Or the modern equivalent of acoustic foam on the wall. This will only improve the internal acoustics of the room. What we mean by this is that the room will have less echo. The foam egg boxes rugs on the wall all act to break up the hard surfaces meaning the sound doesn’t easily echo back into a room. So, if you have lots of hard surfaces and are troubled by echo then think about adding soft furnishings wherever you can. 2) Soundproofing wallpaper will fix my problem. The science of soundproofing is much simpler than most people think. But one of the key ingredients which cannot be got around, is the need to add weight or mass. This is governed by a thing called mass’s law. All soundproofing reverts back to this simple idea. The more weight between you and the problem the better the soundproofing. 3) Injecting foam into the cavity will do the trick. The problem with this is twofold. First foam is very light weight so although you might cut down on the echo in any void you are not adding to the mass. Which we know is very important when soundproofing. Secondly you can’t see where all the foam is actually going and hence you won’t know if the whole wall is completely filled. Even tiny gaps in soundproofing can have a very material effect on the final result. 4) Sticking on a layer or two of acoustic plasterboard ! Now you would think that you are on the right track here. Plasterboard is heavy so if I stick it on the wall it will do the trick. Unfortunately, wrong! Plasterboard is heavy but so is the wall. So another absolutely key thing you need to know is that the plasterboard needs to be added to the wall but not directly to the wall. Your need to add it in a springy way. But more of that later. 5) Installing a built-in wardrobe or cupboards this will do the trick. The wardrobe might work providing it was well fitted floor to ceiling leaving no gap at the top filled lots of clothes and the doors were nice and heavy and fitted well. This would reduce the sound. Book shelves with books sadly wont do the trick as the sound will leak all around them. Well first and foremost you can purchase ear plugs or noise cancelling headphones. These are great things and don’t cost an awful lot to buy. Silence is now golden. The only real drawback is that you can’t hear anything else or if you want to chat or communicate in any way you will hear the dreaded noise again. Earplugs at night are a real winner. This is especially effective if you are trying to have a decent night’s sleep. Running a fan by the bed will drown out all other sounds and you get used to the sound of the fan quite quickly. There are other fancy white noise machines on the market but a fan seems to the trick for many people. Finally you could try negotiating with the neighbours.This can often be a great way to get to know them. It’s a good idea from the outset not to open with the line” turn your bloody music down” This will just open up battle lines and its doubtful you can get back on good terms. More tactful lines might be. I didn’t realise the walls were so thin. I hope I didn’t disturb you last night. A conversation will follow and you might come to an agreement without any finger pointing. After careful consideration, we can confirm that Genie clips “direct-to-wall” are a great soundproofing solution for those who can’t afford to lose too much room space. At just 66mm ( 68mm with the optional Tecsound50 membrane upgrade ), this solution provides great acousic performance in a slimline package, and is well within the capabilities of the average DIY enthusiast, should the mood take you. As with all our solutions, full instructions can be found on our website, and you can of course ring us if you need any advice. We have recently been a lot of good things about the Genie Clip system. This is a new product in the UK. Designed in Canada it is a product that competes with resilient bars. From the look of them they feel like they should be very effective. Rather than relying on the springy nature of corrugated metal as used by resilient bars, the system relies on a rubber washer to keep metal components apart from each other. The manufacturers claim substantial improvements across the noise frequency spectrum particularly at lower, more tricky to deal with, frequencies. The system that works with a bespoke “furring Strip” is less mistake prone when doing a soundproofing job. I can only imagine you need to soundproof your house because of noisy neighbours, that is usually the problem we find.